Mary Wacera (centre) during her final training session with fellow athletes at Nyahururu stadium before leaving for the United States of America to compete in the Houston Half marathon. The 2016 World Half Marathon bronze medallist Mary Wacera's preparations for her full marathon debut begins this weekend when she battles at Houston Half Marathon in the United States of America. Wacera will run her first 42km race at this year's Boston Marathon on April 15 and intends to use this weekend's event as part of her build up. She is not a stranger to the Houston streets having competed and won there before, the most memorable being her 1 hour, 06 minutes and 50 second victory last year, which was the fastest time on US soil. "I am excited but nervous but Boston is not new to me. I have run several BAA 10Ks," Wacera said about her upcoming marathon debut. The half marathon specialist made her debut in road running competitions six years ago and won her first half marathon at the Saint Denis in 1:07:54. She ran three half marathons in 2013, finishing third in the Nice and Mardi Gras half marathons and fifth at the Luanda half marathon in Angola. But it is her win at the 2014 World's Best 10K that raised her confidence a notch higher because she beat top names at the time including the defending champion, Joyce Chepkurui. Having ran about 18 half marathons so far and finishing in podium positions in most of them, Wacera feels she is ripe for the longer distance. Accompanying Wacera is another World Half Marathon medallist, Bedan Karoki. 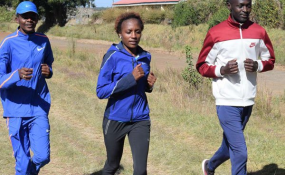 The two athletes took part in did their final training on Wednesday at Nyahururu stadium and are expected to leave the country later in the evening for the weekend race.